You don’t have to worry about “what to do when”. A team of expert chartered accountants lead by our senior partner will always be available to handle your company hassle free. VenturEasy brings to you Specialized Business Packages providing complete accounting, audit, taxation, registrations and annual compliance services. These packages are much more affordable compared to the cost of individual services and the best part is that they provide you peace of mind while running a business. You don’t have to worry about “what to do when”. A team of expert chartered accountants lead by our senior associate will always be available to handle your assignment, collect documents, punch your accounting entries, contact you for every compliance, generate reports for decision making and assist you in every matter. A potluck of services to make your company get set going. Our business packages are designed to provide you with all the essential business management services such as punching accounting entries, preparing , Financial Statements, making TDS compliances, ROC compliances and much more. You don’t have to keep a track of how much did you spend on each service. You get everything at a consolidated rate which is much more economical compared to individual pricing. VenturEasy expert punches your accounting entries, he verifies the same with the supporting’s and also checks for applicability of TDS. 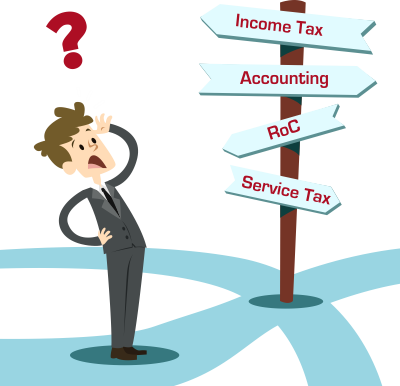 It is double checked while finalizing the accounts and making payments and filing returns. Hence, the scope of any error is highly minimized. We are not stringent in our packages. Additional services like getting refunds, planning your taxes, solving queries, issuing CA certificates for various purposes are also included on a case to case basis. You can chat, phone, skype, email or call us for your requirements. We will keep all your documents in a secured cloud storage so you have access anywhere any-time. We love to keep your business hassle free and speedy. We meet our deadlines. We will contact you for any compliance well in advance to avoid last minute rush. Our packages are designed to deliver value in terms of time, money and client satisfaction.